JAMMU: Asking New Delhi to give up its colonial approach towards Jammu and Kashmir, AIP President Er. 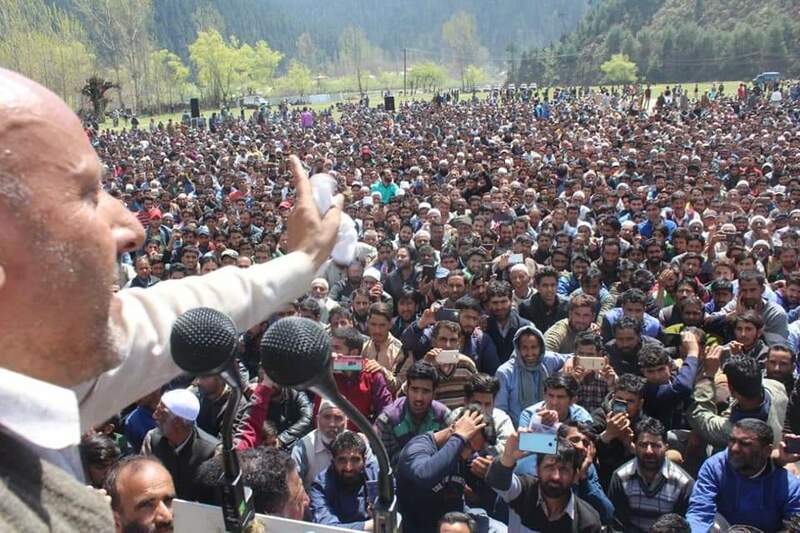 Rasheed has alleged that New Delhi under a well-crafted plan has ignored Muslim dominated areas in Jammu province and deprived them of basic immunities. While addressing election rallies at Neel, Banihal, Khaddi, Chareel and many other places In Chinab valley today Er. Rasheed said that the national high way ban has made life of people of entire state and particularly those of Banihal and Ramban areas worse than hell. Er. Rasheed said “Not only that security agencies have imposed restrictions on travel ban, the widening of so called national highway has become a gold mine and a money making machine for the construction company and other blue eyed Babu’s. The resources of Chinab valley have been put to sale to non-state subjects and the inhabitants of the entire Chinab valley have been reduced to second class citizens”. Er. Rasheed accused Congress, BJP, NC and PDP of playing communal politics just to get votes. He said “While NC and PDP are in head on collusion with each other in valley but in Jammu their politics and designs are mysterious. Let them not forget that it was Dr. Karan Singh, father of congress nominee, who claimed with pride few days ago that congress has the distinction of breaking Pakistan into two pieces. While NC, PDP and Congress try to gain sympathy of Muslim and Dalit voters by trying to portray themselves as secular but the language being used by Karan Singh and other leaders tries to attract Hindu voters by sending signals that Congress is more ultra nationalist and more fundamentalist than BJP”. Er. Rasheed while lashing out at BJP accused BJP leadership of trying to Saffronise he Jammu region by implementing an agenda of exploitation and raising religious sentiments of the other community. Er. Rasheed said it is shameful that neither congress nor BJP gave mandate to a single Muslim candidate from either of the two seats in Jammu province. Congress and NC have acted like collaborators to create fear psychosis in the Muslim community and have handed over the entire Jammu province to BJP and Congress by making a complete surrender”. Er. Rasheed while demanding judicial probe into killing of 13 year old Owais Ahmad Mir has reiterated that whatsoever happened in Mandigam was part of a conspiracy and the entire series of stone pelting in that area was engineered by people conference workers just to ensure poll boycott in the area. Er. Rasheed while condemning use of brutal force at Mandigam on polling day said that few agencies and a section of state administration had already planned to create disturbance by taking support of PC cadres to ensure that people don’t caste their vote but these cowards should know that playing with the innocent lives and martyring teenager Owais Ahmad only for ensuring victory of proxies of RSS will not help and sooner or later every Kashmiri will unmask the true face of these proxies, who have sold out their conscience and can do any damn thing for their political gains.